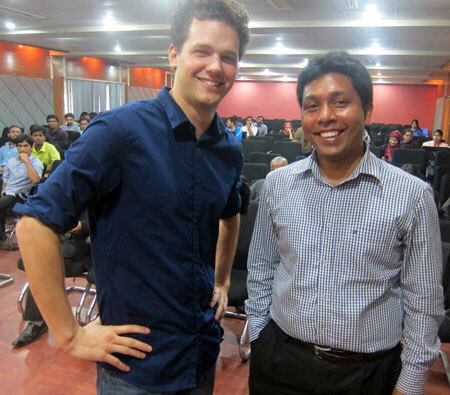 In spite of the volatile political situation in Bangadesh, with an almost continous hartal issed by the main opposition party the BNP for over a month, and with acts of violence frequently appearing, Lars and Bubu Eklund decided to travel from Kolkata to Dhaka on 20 Febrary 2015, a day before the Language Movement Day, 21 February, celebrated in a big way in Bangladesh in commemoration of the sacrifices laid down by Bengalis in 1952. 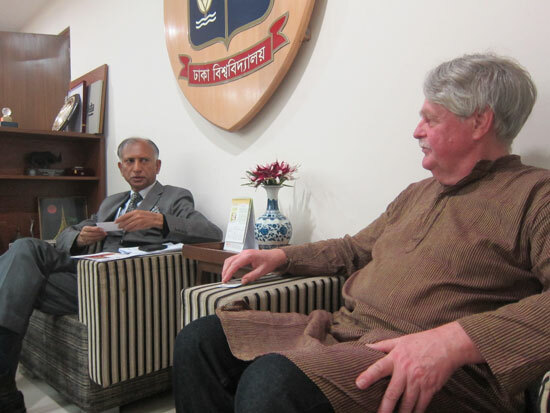 He was invited to participate in a workshop at Dhaka University, a university that SASNET and Lund University has several connections to, but he was also in town to visit the Swedish Embassy (see separate report), and on the same day they visited Dhaka Unversity, he also visited three other universities in he city. We were not the only Kolkata visitors to Dhaka to attend the Language Movement Day, one day earlier a whole delegation led by West Bengal Chief Minister Mamata Bannerjee had flown in to meet Prime Minister Sheihh Hasina – Mamata promising her sudden wilingness to accommodate a solution to the long-standing problems in Indo-Bangladeshi relations, especially solving the issue of sharing the river Teesta water. ”We give you water, and you give us Hilsa” was the slogan, referring to to the West Bengal appetite for the delicious Hilsa fish that is caught in the rivers of both parts of Bengal, but is supposed to be of a higher quality in Bangladesh than in India. 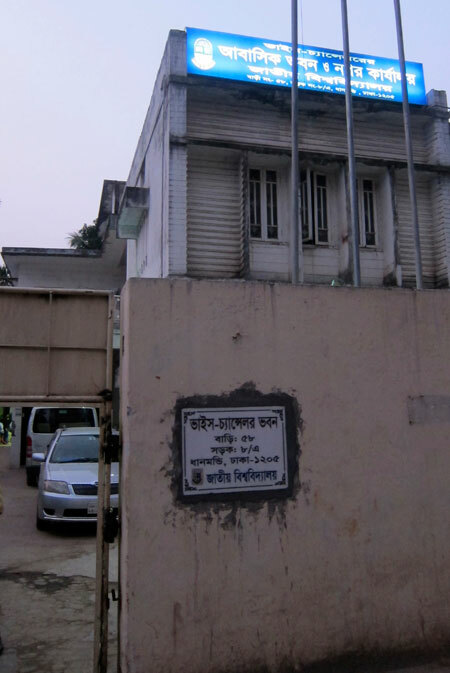 Political tensions between the Awami League-led Government and opposition parties led by the Bangladesh Nationalist Party (BNP) increased in January 2015 on the first anniversary of the 5 January 2014 parliamentary election, which the BNP boycotted. 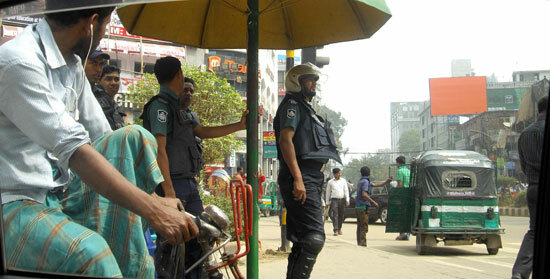 The police had banned all protests and rallies in Dhaka and there was a strong and visible security presence on the streets of Dhaka. However the BNP had called for a nationwide blockade of all road, rail and river transport since one month back, and this blockade has been marked by violence and sporadic clashes between the police and protestors. Petrol bombs and small crude hand made bombs (known locally as cocktails) have been used as deadly weapons. I knew for sure that the British Foreign Office warned against moving around in Dhaka, particularly around political offices, government ministries and Dhaka University campus. 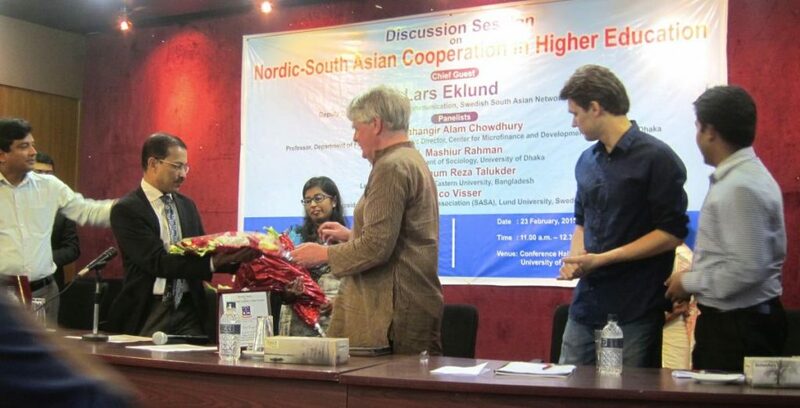 Still I decided to accept the invitation by my hosts to attend a Seminar on Nordic-Bangladeshi collaboration in higher education, since they guaranteed that I would be perfectly safe in their company. 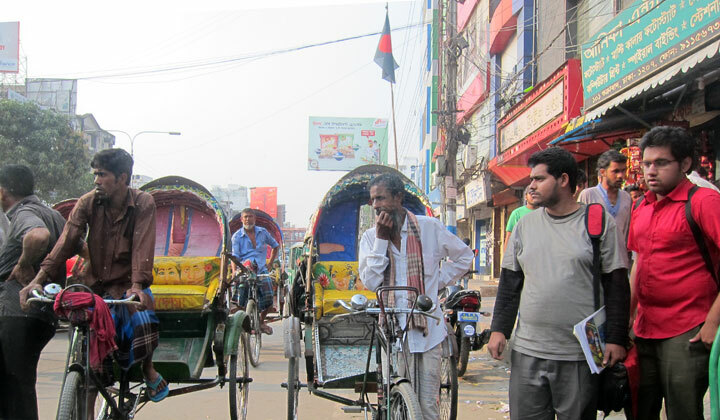 Another thing is that most people in Dhaka are so fed up with the hartal that they carry on driving by car in defiance of the imposed blockade. 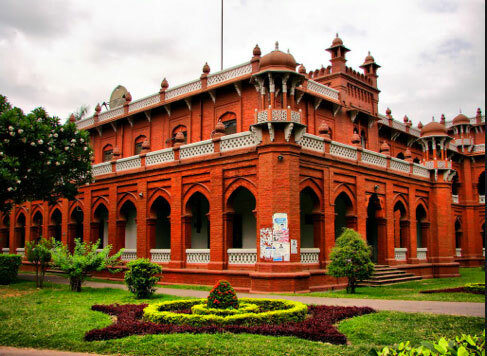 Dhaka University was established by the British colonial government in 1921, it gained a reputation as the ”Oxford of the East” during its early years and has been a significant contributor to the modern history of Bangladesh. After the partition of India, it became the focal point of progressive and democratic movements in Pakistan. 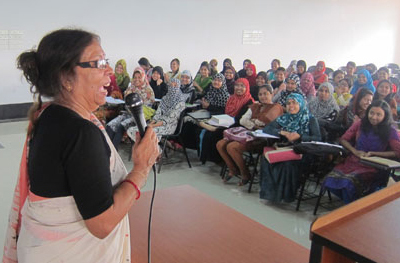 Its students and teachers played a central role in the rise of Bengali nationalism and the independence of Bangladesh. The university’s distinguished alumni include Satyendra Nath Bose (pioneer of Bose–Einstein statistics), Fazlur Rahman Khan (pioneer of modern structural engineering), Muhammad Yunus (winner of the 2006 Nobel Peace Prize) and Sheikh Mujibur Rahman (the founding father of Bangladesh). Today, it is the largest public university in Bangladesh, with a student body of 33,000 and a faculty of 1,800. Professor Mashiur Rahman, who defended his PhD in Sociology at Lund University in 2011, and then returned to his home university, Dhaka, to take up a professorial position, had specifically asked me and my accompanying wife Bubu to attend a class with his first year Sociology students. 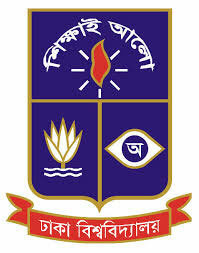 Mashiur had explained that the major reason behind his decision to return to Dhaka University is the enthusiasm and high quality of the students. 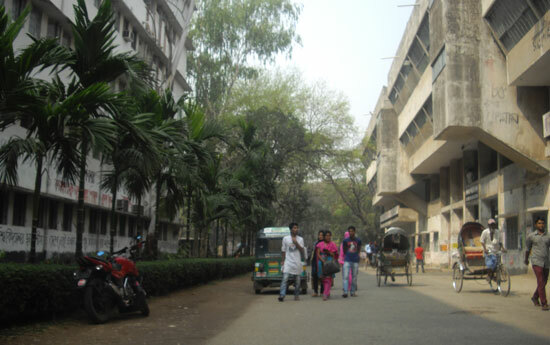 After reaching Dhaka University campus, which by the way is one of few parts of the Bangladeshi capital city where old buildings – many from the colonial days – still remain untouched, and with lush greenery around (all over Dhaka old buildings are otherwise demolished and new 14-15 storeyed buildings come up close to each other, and ponds and parks being converted into building sites), we followed Mashiur to the seminar hall where the class, consisting of more than 100 students, half boys half girls had assembled. We were asked to enter the podium and Mashiur introduced us. I then gave an overview presentation on the Swedish universities, the academic requirements for studying in Sweden, and possibilities for getting scholarships or being involved in different forms of exchange programmes. The interest was huge, and so many questions were raised by the students, not all related to Sweden, but they also wanted to have my view on the academic standard of Bangladeshi universities and other issues difficult to judge for a temporary visitor. Bubu then sang a couple of rabindrasangheet (Tagore songs), to the immense pleasure of the students, most of whom gladly joined in the singing of the national poet Rabindranath Tagore’s poems. And finally, when the class was over, a lot of students came forward and wanted our autographs! First time ever I had this experience. See photos below! Before heading for the seminar for which I had been invited to attend, Mashiur managed to arrange for a meeting with the Vice Chancellor at Dhaka University. 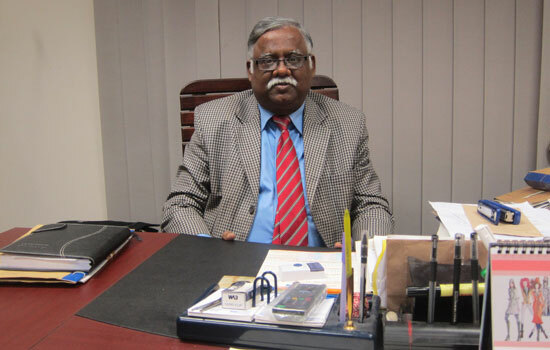 Professor A A M S Arefin Siddique basically belongs to the Department of Mass Communication and Journalism, he was appointed VC in the year 2009. He presented the basic facts of his university, which has a strength of 33 000 students in 13 faculties plus 11 institutes. 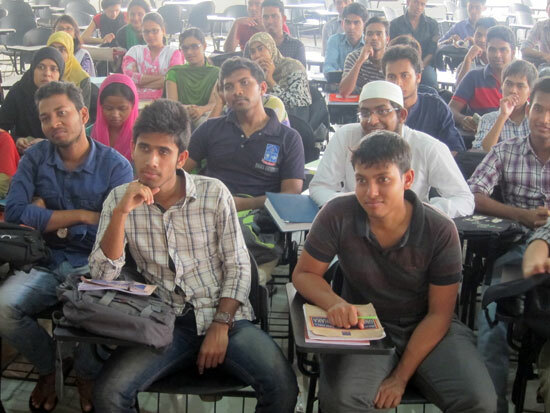 Besides the main Dhaka campus DU has a number of 95 affiliated colleges all over the country. See a list. 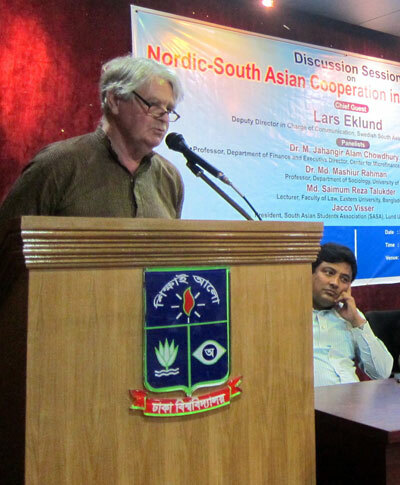 When learning that I was supposed to visit Dhaka, M. Jahangir Alam Chowdhury, senior Professor at the Department of Finance, and Executive Director for Dhaka University’s Center for Microfinance and Development, decided to arrange a programme in the form of a discussion seminar, to focus on Nordic-South Asian Cooperation in Higher Education. 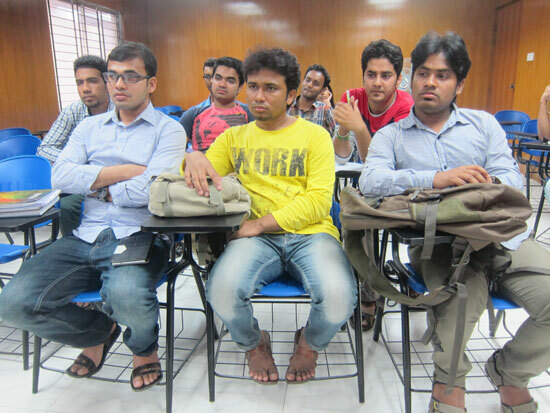 The well-attended session was held on Monday 23 February 11.30-13.00, in the Conference Hall, Faculty of Business Administration, University of Dhaka. Jacco Visser and Saimum Talukder. Another partner in the planning of this seminar was Md. 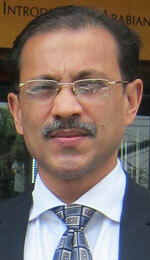 Saimum Reza Talukder, and the Bangladesh Study Forum (BDSF), an organization of which Talukder is a leading member. He is also a Lecturer at the Department of Law at the private Eastern University in Dhaka, but has additionally a strong connection to Lund University, being a participant to the Social Innovation in a Digital Context (SIDC) programme at LU in 2013-14. This is a one year academic scholarship programme for social and digital innovators from the Middle East, North Africa and South Asia. It is carried out by Lund University on behalf of the Swedish Institute. More information about the programme. 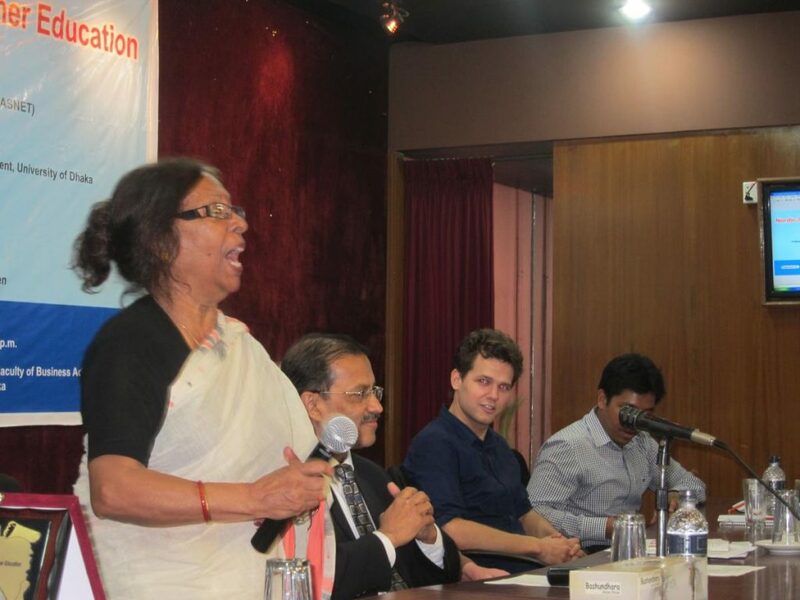 While in Lund, Saimum was involved in a project entitled ”MUKTOBAK – Advocacy for online human rights defenders”, focusing on the freedom of expression online by engaging the bloggers, online activists and human rights defenders of Bangladesh into awareness building capacity programmes. I was presented as the chief guest at the seminar, such is the high reputation that SASNET bears in Bangladesh, and the expectations were high. The organizers hoped that my presentation should enhance knowledge exchange fostering tertiary level academic collaboration with the Nordic region. I therefore tried my utmost best to present the Swedish and Nordic research connected to Bangladesh, the various forms of collaboration possibilities that exist, and the procedure for Bangladeshi students interested in studying/doing research in the Nordic countries. at Lund University, currently staying in Dhaka doing fieldwork for his Masters thesis in Asian Studies. Jacco was given an opportunity to tell his experiences from being a foreign student at Lund University. As the final part of the seminar Bubu Munshi Eklund performed a few rabindrasangheet songs, and I also joined the concert while singing the Tagore song Aji Boshonto in Bengali. 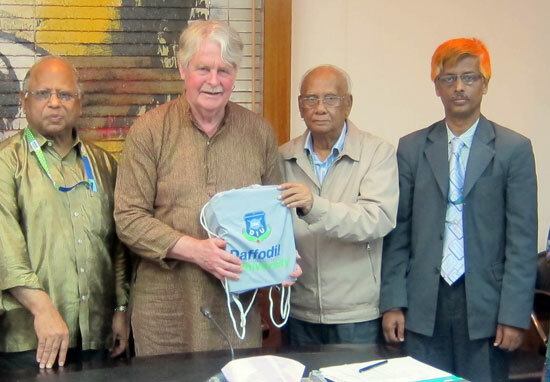 After lunch, a hectic afternoon programme followed, visiting three other Dhaka universities, two private – Daffodil International University (DIU) and Eastern University – and one public, National University. Former Lund University Masters student Yieaser Arafat – who came to Sweden as n Erasmus Mundus Action 2 scholarship holder in 2012, had kindly asked me to pay a visit to his university. 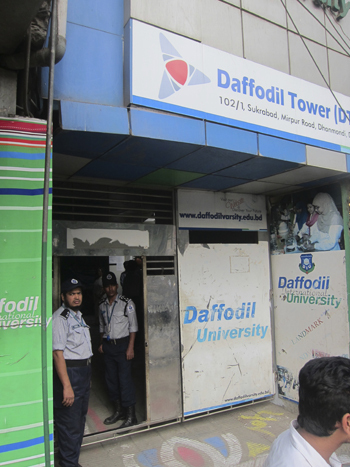 At Daffodil University, its main city campus being a high-rise building in central Dhaka, a meeting was organized by Mohamed Emran Hossain, Director (Administration), and Professor Md. 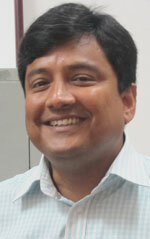 Fokhray Hossain, Director of International Affairs (and also Head of the Department of Natural Sciences). DIU is part of a business conglomerate – the Daffodil Group chaired by Md. Sabur Khan. This private sector actor is investing more and more in the education sector. Currently they are building their permanent campus at Ashulia, Dhaka where there will be modern facilities for university students. The university is keen on establishing international collaboration, and its has till today linkages with over 100 universities worldwide, including Uppsala University in Sweden. The collaboration is within he field of Chemistry, and the Uppsala partner institution is the International Science Programme (ISP) led by Peter Sundin. The meeting was also attended by Prof. Ahmad Ismail Mustafa, Dean of the Faculty of Allied and Health Sciences (FAHS) and Head of the Dept. of Nutrition and Food Engineering. He and Prof. Hossain informed about their strong research fields with an ambition that SASNET could identify possible partners in Sweden to launch a joint research centre. Before leaving DIU, a quick visit was made to the Managing Director of the Daffodil Group, Mr. Sabur himself. Next stop was Eastern University, where Saimum teaches. 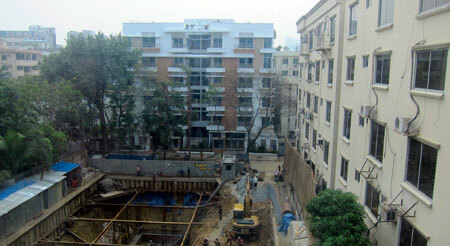 This is yet another private university located in an ordinary residential building in central Dhaka. Unfortunately time was rather late in the afternoon, so it was not possible to meet much of the staff, however some of Saimum’s own students had eagerly waited for our visit, and again I made a presentation on Swedish universities and possibilities for coming to Sweden for Bangladeshi students. Finally, we again met Prof. Mashiur Rahman from Dhaka University. An unusually dedicated academic with a large contact net in Bangladesh – he was for example the person that made is possible for SASNET to arrange a seminar with Bangladeshi Prime Minister Sheikh Hasina at Lund University in December 2009 (more information). Now he wanted me to meet one of the most dynamic academic leaders in Bangladesh, namely Prof. Harun-or-Rashid, Vice Chancellor at the National University. With a PhD in Political Science from University of London, Prof. Rashid now heads a unique university. The National University, established in 1992, is a conglomeration of affiliated colleges all over the country. It consists of 2 154 such colleges, with a total amount of 2 million students. 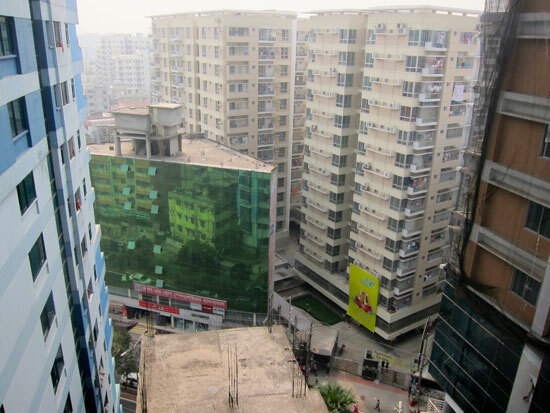 The university has a small campus 30 km north of Dhaka, and a flat in Dhaka where the Vice Chancellor has his office, but otherwise the university is totally decentralized. More information about National University.